The American Go E-Journal‘s special coverage of the World Amateur Go Championships (WAGC) begins with tomorrow’s edition. Each morning’s edition will include our reports through midday local time in Hangzhou, China; click here anytime for the latest live news, posted as it happens by the EJ/Ranka Online team. The daily WAGC E-Journals will also include special game commentaries usually only included in the Member’s Edition, provided as part of our support for world go. We hope you enjoy our complete coverage of the 31st annual competition among top amateur players from around the world, which runs through May 31. The weekly E-Journal will resume next week. 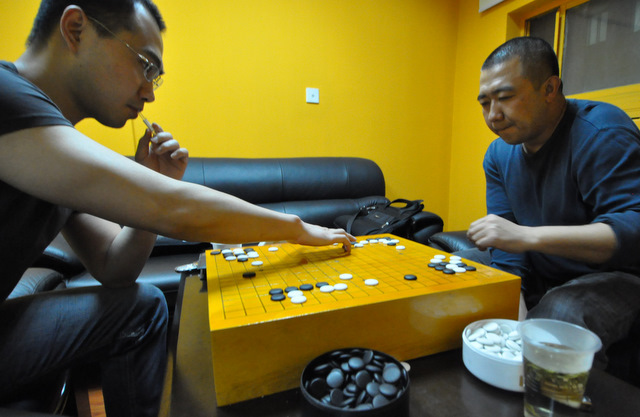 If you have any doubt about whether go is alive and well in the land where it was invented, show up on a Sunday night at the Tongzhou Middle School in Shanghai. Night has fallen and the streets are quiet, but the school is a beehive of activity. More than eighty kids are gathered in four classrooms, excitedly shouting out answers as their teachers lay out go problems on demonstration boards. The youngsters, ranging in age from four to twelve or so, sit — when they’re not leaping up to try their move — at special classroom desks stencilled with go boards; the plastic go bowls swing out from beneath the desktop. 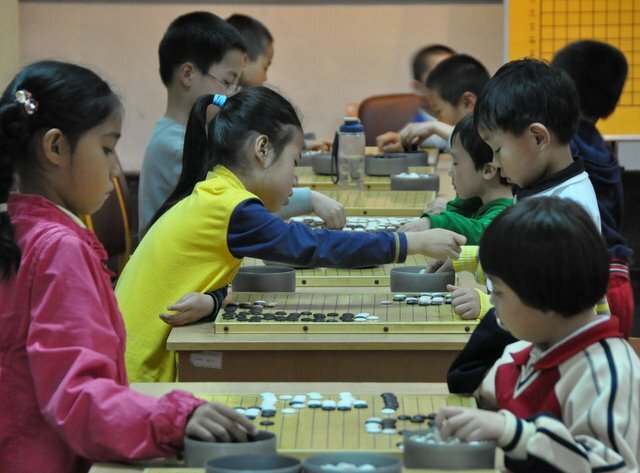 The school, which currently has more than 300 students, is run by the Tongzhou Go Association and was founded in 1998 by Qin You Min, a go-loving amateur 5-dan businessman who’s also on Shanghai’s team of strong amateurs. Most of the students at Tongzhou are from local primary schools, and indeed Qin learned to play when he himself was in primary school. “Go is an important part of traditional Chinese culture and once I learned, I just could not give it up,” he said with a smile and a shrug. 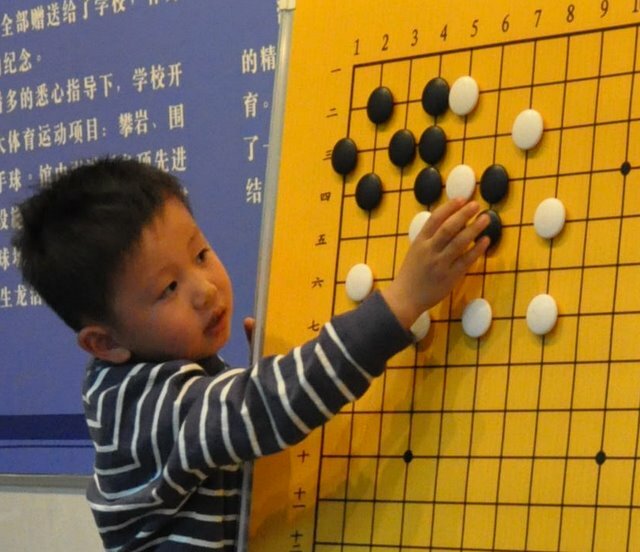 When the principal of the Tongzhou Middle School asked him to start up the go school there, “I could not say no.” Like many an American school, trophy cases — in this case for go championships — line the wall in Tongzhou’s front lobby. Unlike the privately-run Blue Elephant School, Tongzhou is part of the official China go sports system and its team participates in national go tournaments. “A good teacher is the secret of good training,” Qin. 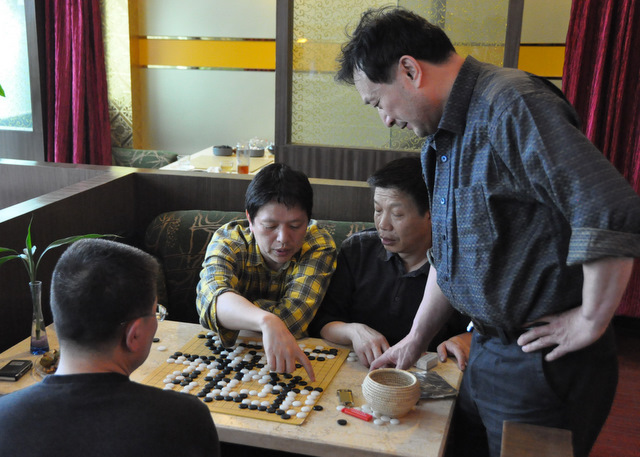 Liu Yi Yi 2P is the team’s main coach, and other pros often come to teach as well as the three full-time teachers and seven part-timers. In just twelve years, the school has already generated four professionals, Qin tells me proudly. The team trains daily, with cultural lessons in the morning and then go lessons in the afternoon and evening. Tonight’s classes are levels 2 through 5. The Level 2 kids — who teacher Bai Yi Ping has to lift onto a chair to reach the demo board — are 8 kyu and are learning to count liberties. In adjoining rooms a Level 3 class of 7 kyus is reviewing capturing races, a Level 4 group of 4 kyus is reviewing their games and a Level 5 class of 1 kyus is studying life and death problems. The energy in the school is vibrant, with the kids both focussed and having fun. 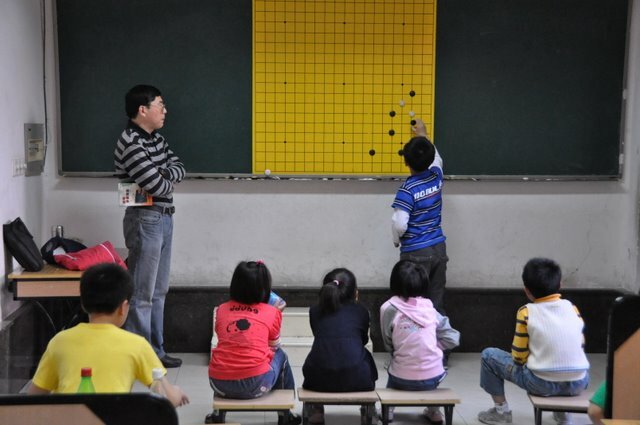 In the Level 4 class, for example, the kids are working intently together to replay and record their games, while in the next room the tiny Level 2 students are literally jumping up and down in their seats to be chosen to solve the problem on the board. “Play more games with Chinese players,” Qin says when I ask his advice for how American players can improve. 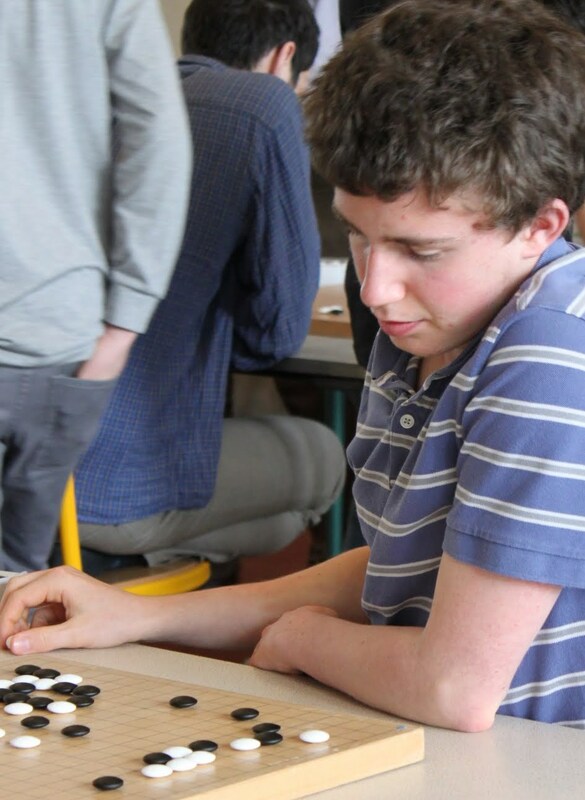 Catalin Taranu 7d defeated Cristian Pop 7d in an exciting Balkan Go Championship 4th-round game that led to Taranu’s sweep of the May 19-23 event. Pop was second at 5-1 and Cornel Burzo 6d took third. 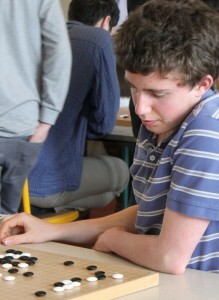 Burzo did take first in the Blitz event, with Mihai Serban 4d second and Pop third. In the Pair Go event, Serban and Laura Avram 2d went 4-0 and captured first place. The tournament took place just outside of Bucharest, Romania. 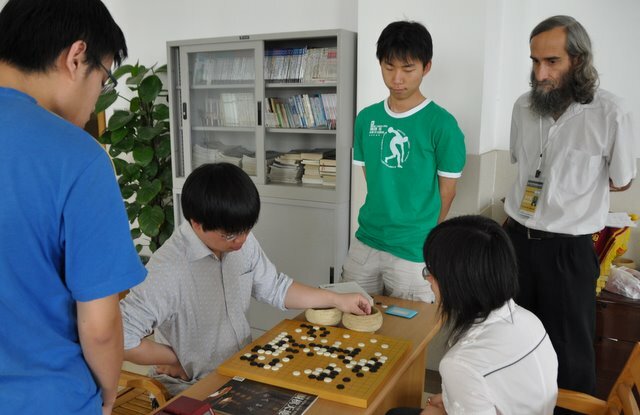 Hwang In-Seong 8d went 5-0 to take top honors at the 13th Madrid Go Tournament, held May 15-16. 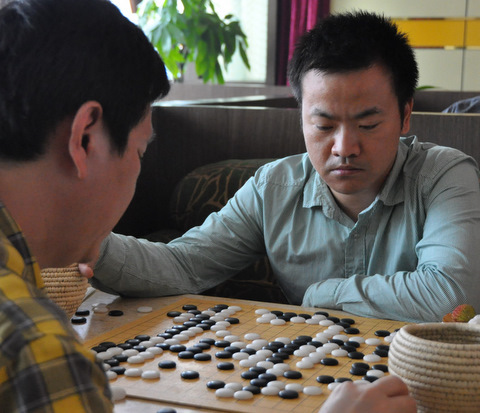 Lluis Oh 6d was second with four wins, while Mao Feng 4d came in third at 3-2, including a surprising upset of Li Yue 5d. 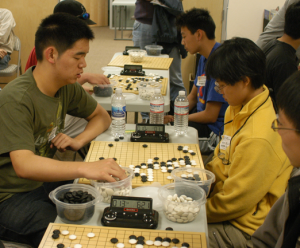 Hwang is currently third in the European Go Federation rankings. 63 players took part in the tournament. Eleven out of fourteen of you guessed that it was go writer John Fairbairn who came to dinner recently. For those who do not know, his name does in fact “rhyme” with “bair” sounding the same as “fair.” John has translated many books for Ishi press and is the quieter half of the GoGoD team. 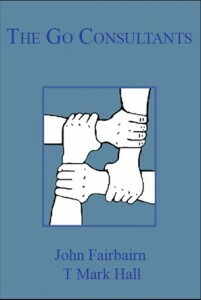 Recently his books from Slate and Shell have been receiving high and well-deserved praise. He attended several Orioles games during his recent visit — and even saw them win! — as well as a Phillies game and a Nationals game. 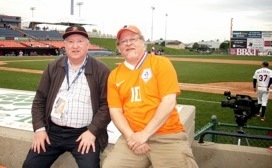 Here we are pictured on our excursion to Frederick to watch a game by the Orioles single-A farm club, the Frederick Keys. I really enjoyed spending time with John, and look forward to a long and ironic friendship between an English American baseball fan and an American English football fan. Sadly, the Go Quiz has run its course. Participation is down this year and the response received does not justify the time and space involved. I really want to thank everyone who participated and everyone who enjoyed the Quiz and I hope some of you learned something and maybe your interest in go was increased in some fashion. Final Standings: Phil Waldron 11/13, Grant Kerr 9/10, Kim Salomony 9/11, Scott Pederson 8/8 and Lin Nei 7/8. Many thanks to Phil Waldron, who never missed a quiz, Grant Kerr, who only got one wrong and my biggest fan Kim Salomony. Finally, a special thanks to an old friend, one-time rival, and one-time Congress ride buddy who easily wins the all-time award for most wrong answers. You too are namelessly appreciated. The American Go E-Journal will publish special daily editions this week live from the World Amateur Go Championships (WAGC) in Hangzhou, China. We’re teaming up again with Ranka Online this year to provide complete coverage of the 31st annual competition among top amateur players from around the world, which will run May 24-31. American-born pro Michael Redmond 9P will provide game commentaries for the Ranka/E-Journal effort – which will include ongoing updates on both Ranka and the AGA website , as well as via the daily E-Journal reports — while Ivan Vigano, James Davies and Chris Garlock will report and John Pinkerton will provide photos. 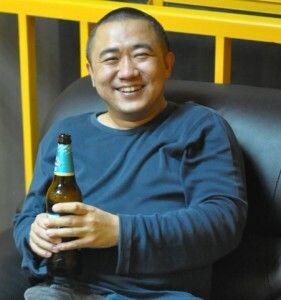 The way drinking go works, Jacky Sun explained at dinner Friday night, is that the loser of the game has to down a beer. “I played the former European go champion, I think he was from Finland, maybe, and I lost the game but I won the drinking,” Jacky boasted. 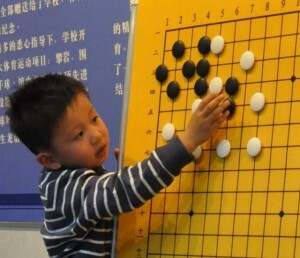 He and Qin Zhixuan were playing in the teacher’s room at Jin Sheng Yu’s go school Friday night while I played a simul with two students (see Chicken Feet, New Friends, the Mysteries of Go and Pint-Sized Players). After the kids left, EJ photog John Pinkerton and I went in to check on the game. Qin was trying to activate some non-existent aji but Jacky was giving no quarter and soon Qin was paying for his loss by downing a giant bottle of Suntory in one long gulp. Go is thirsty work. After the Blue Elephant Go School visit Saturday morning (see At the Blue Elephant Go School), Du Yufeng 3P dropped us off at a coffee shop where some of her friends have been playing go every weekend for seven years. “There aren’t really any go clubs in Shanghai,” Danny Wang (below) told us. “It’s easier just to play on the Internet, and it’s free.” Still, Danny and his friends — all very strong dan players — prefer to hang out at the coffeeshop on the weekends and they welcomed us to the gang, keeping our glasses filled with tea, showing us how to peel ripe lychee nuts and taking turns giving us games. “Go is a good way to make new friends,” Danny said. The afternoon slid by as rain pattered outside and stone s clicked on the boards. We lost track of time and how many games we played. After a few games with one player, another would take his place. Some smacked their stones down forcefully, some gently. All smoked and all played classically good shape patiently, never gambling on a quick win. At game’s end the stones would fly around the board during Chinese counting and each time we’d come up short and the cycle would begin again. After a dinner break nearby — Chinese food family-style with beers and toasts each time our glasses were refilled and a discussion about favorite go professionals — the games continued into the night until finally it was time to say goodbye — until next time — to our new Shanghai go friends. Mission San Jose won the Bay Area High School Go Tournament, held April 25th in Cupertino, CA, which attracted five schools and 24 players. Organized as a team tourney, Saratoga High was favored to sweep the A division with a 3-dan and two 1-dans competing. However, Mission San Jose narrowly claimed victory when their 1st and 2nd boards slipped by with single digit margins of victory, in a heated Round 3 match against their Saratoga rivals. The tourney debuted this year as a collaborative effort of the AGF, the Bay Area Go Players Association (BAGPA), and several high school organizers. The tourney was organized by David Su, and directed by Steve Burrall. Winners Report: A Division: Mission San Jose; B Division: Monta Vista; C Division: Saratoga High. Photo: Mission San Jose (left) defeats Saratoga (right) in the deciding match.